There are some excellent references that you should read covering the installation. 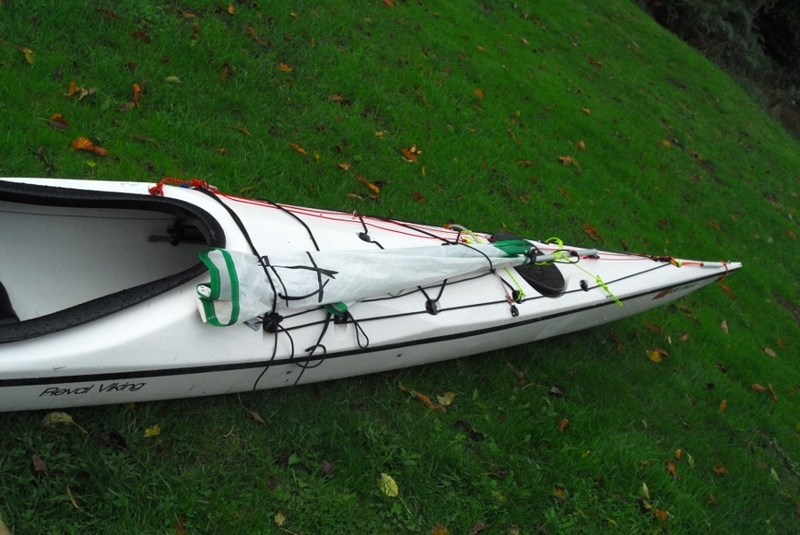 Firstly take a look at Douglas Wilcox’s excellent Text with photos of installation on several different Kayaks. FITTING INSTRUCTIONS Each kayak is different. 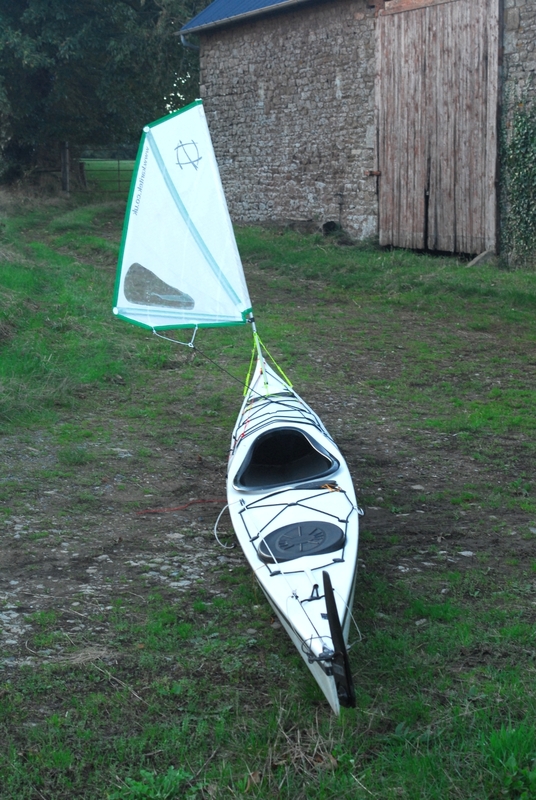 I purchased a Flat Earth sail and Mast and had already put together my ‘fitting’ kit. The Sail arrived and includes the mainsheet and is already attached to the foot of the sail. The Mast arrives as an assembly, two long sections of tube for the mast with a shorter stub section to mount the universal joint into. 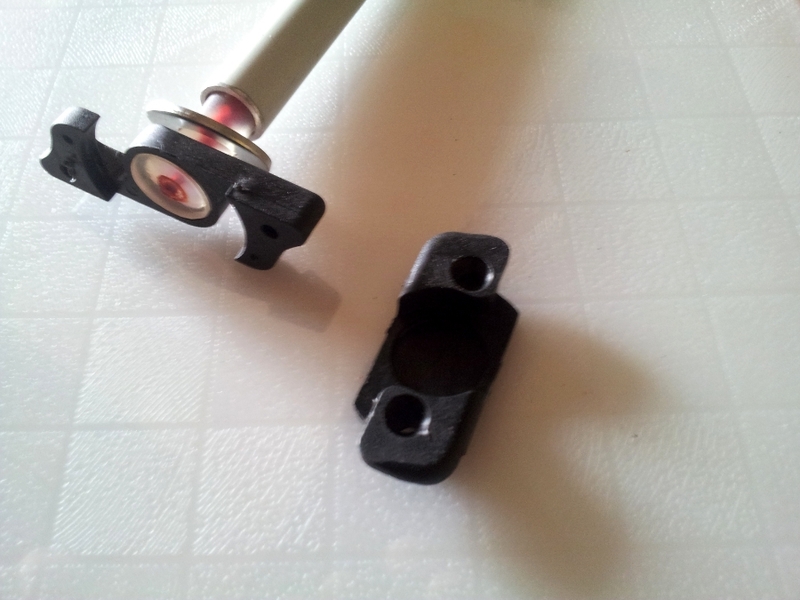 The top mast section slides into the bottom section and rests on an internal rivet stop, then the assembled tubes slide over the Stub section and rests on a washer over the universal joint foot. 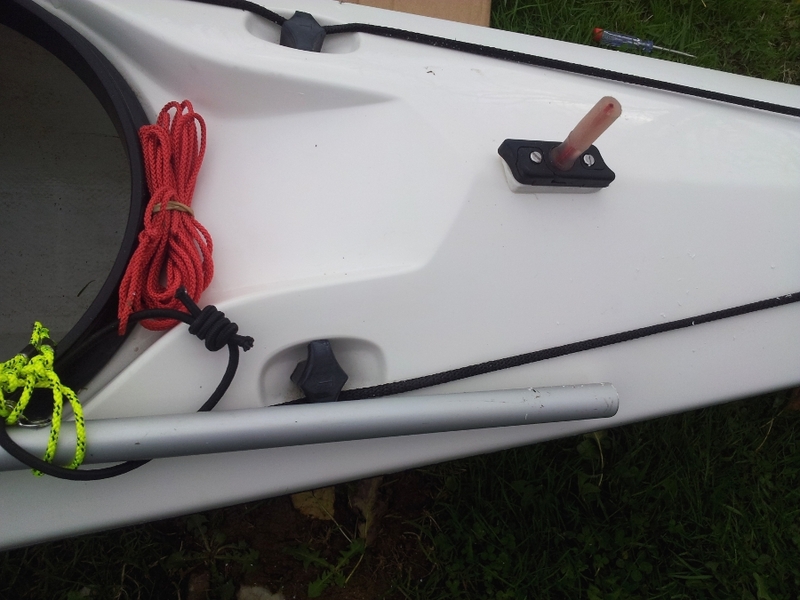 The mast is fitted to the Deck using a Dinghy Tiller Extension Universal Joint, it consists of three parts, the fixing plate (bolts to deck) a locking plate and the rubber joint spigot. 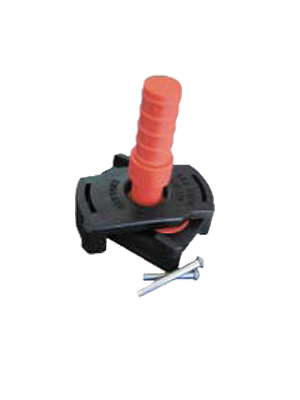 Karitec fit the spigot into the stub tube (it needs to have the diameter reduced a small amount) The mast has a stainless steel saddle fitted to retain the Stays and the uphaul shock cord. 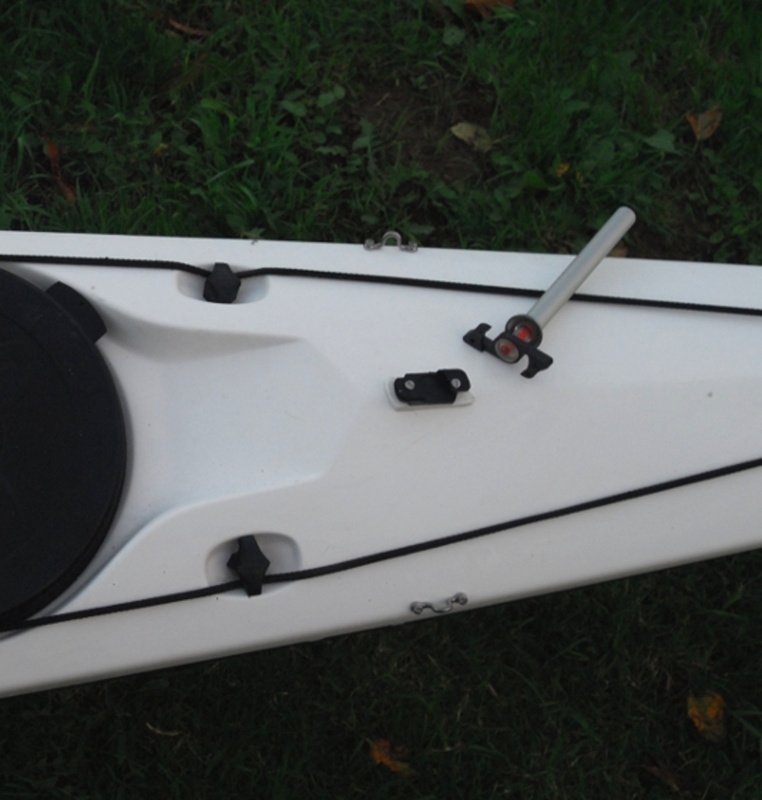 I selected the position for my mast foot simply by sitting in my kayak and laying the mast alongside in the stowed position. 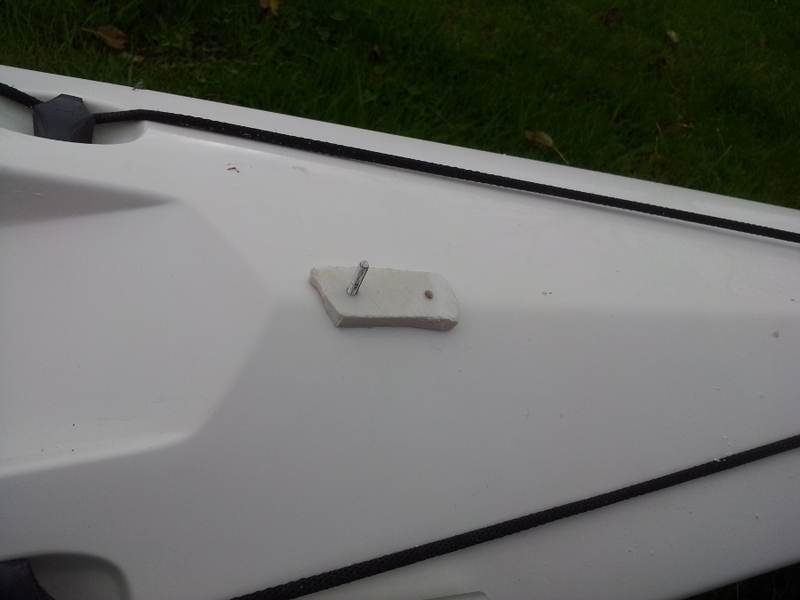 I wanted to make sure it did not interfere with my paddling when parked on the deck. 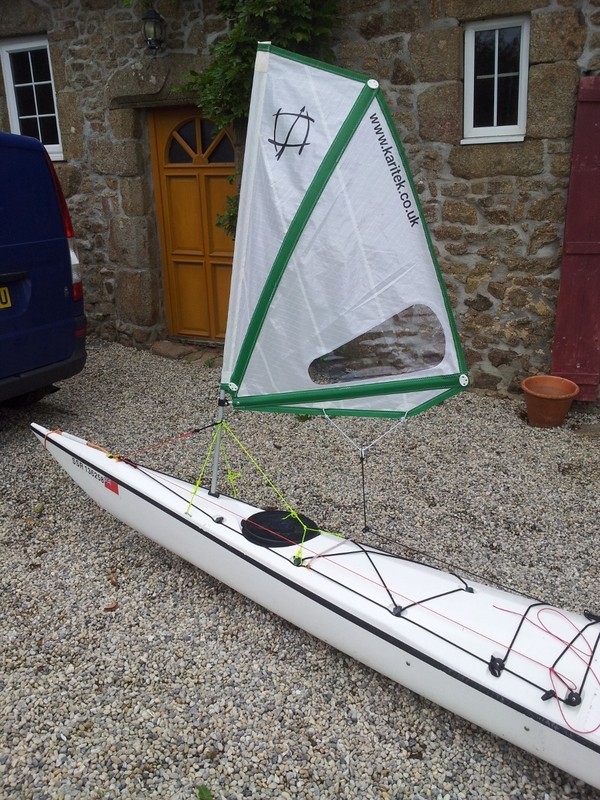 I’ve installed the sail on my Tahe Wind 585 which has great length. With the Mast foot mounted just in front of the compass recess it all fits great. I checked out the rigidity of the deck for the mast foot, the ridges formed in the deck at this point result in good strength and allow the downward forces to be dissipated over a much greater area. 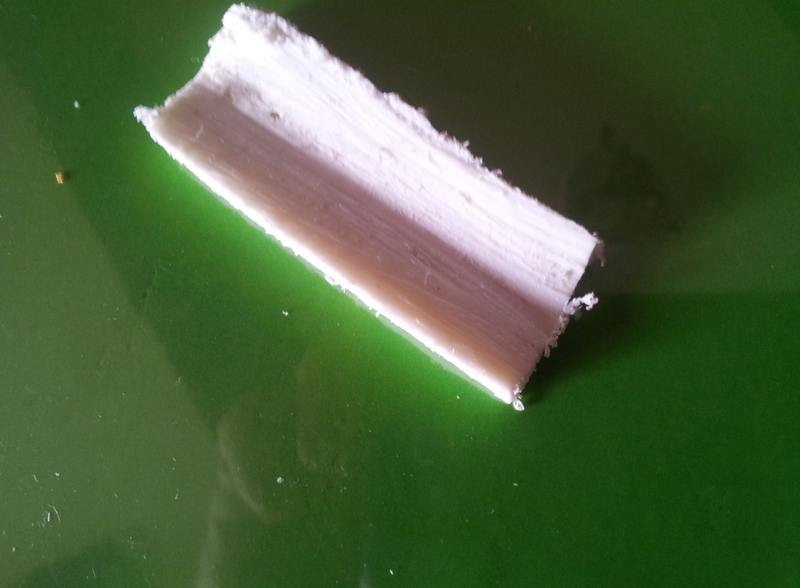 I did not need to add any additional reinforcing. For the backstay, I tied a loop in a length of dynema and secured it to the two deck fittings just behind the hatch, the single backstay coming off the mast is then tied into the loop of this spreader. It might well be the case that I revisit this at a later date and perhaps install another low profile deck fitting to take a pulley. I have installed my ‘mainsheet’ cleat on the cutaway side near the cockpit, still not decided on a locationfor the uphaul and will likely use a stainless quick release shackle on the deck lines as a temporary measure. 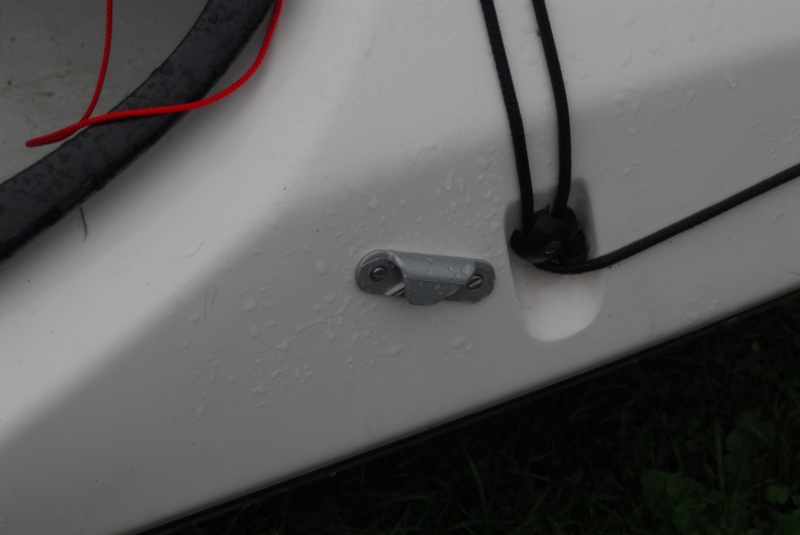 After just one trip on the water I found that the ‘quick release shackle’ needs to be replaced. It required two hands to raise the mast and load the shackle, this was good enough reason for me to go out and buy a micro Camcleat. I found the 3mm uphaul line a little to small, and a bit harsh on the hands, so at the same time replaced it with some 5mm cord, the camcleat works well with the new uphaul and easy to use one handed. I also received an excellent tip from the Flat Earth designer and Sailmaker Mick MacRobb regarding securing the flexible spigot into the stub mast, Mick tells me a stainless screw driven between the spigot and the inside wall mast wedges the spigot in tight and secure, thanks Mick ! I’ve not gone into any detail regarding drilling holes and the like, this is well covered by Douglas Wilcox in his instructions and of course elsewhere on the net. 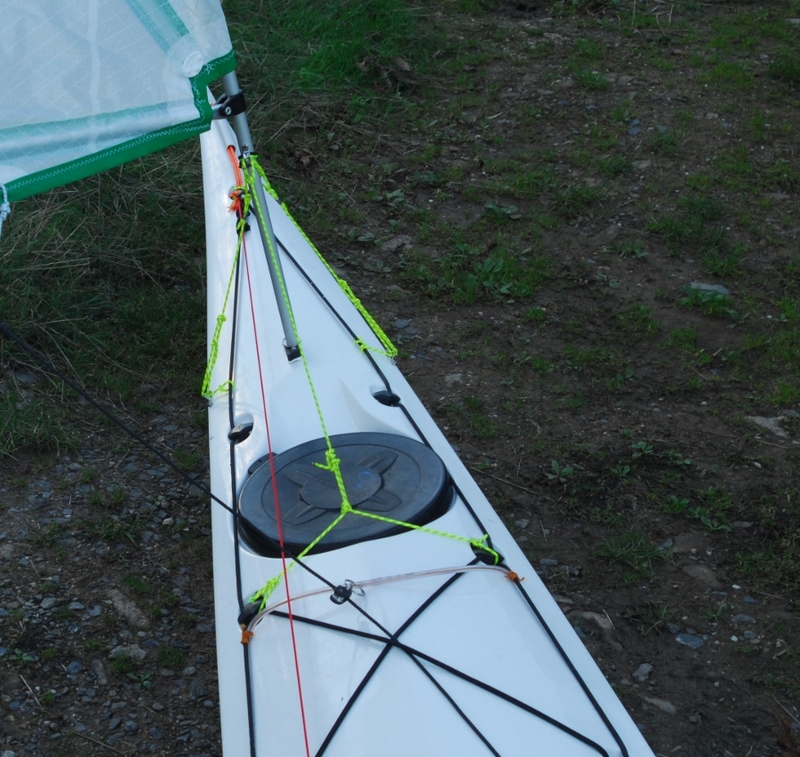 My installation was very straightforward, less than 3 hours, now just waiting for some wind to test it !